Seiko QXJ003BLH Tambour Mantel Clock Solid Oak mantel clock in a tambour style with Glass crystal. 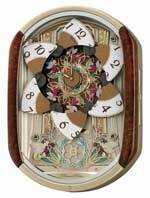 Ornate inner dial features an intricate vine pattern with applied numerals. Accurate Quartz Westminster/Whittington movement with quarter-hour chimes, hourly strikes. Volume control for chimes with Nighttime shutoff option. Batteries are included with this selection. One year warranty and Free Shipping. Size: 10-1/2" x 16-1/2" x 5-1/3"